May Our Exports Be Plentiful! A message from Under Secretary of Commerce for International Trade Francisco Sánchez. Follow him on Twitter @UnderSecSanchez. Here at the International Trade Administration, we celebrate trade all year long. And with good reason: trade brings benefits to all parties involved. It brings development, economic growth and jobs – all good things. As President Obama announced, this week is World Trade Week, during which we recognize export success and highlight how exports can lead to a bright economic future. At ITA, we take it a step further. All this month, we've been celebrating #WorldTradeMonth. In May, we recognize National Travel and Tourism week by highlighting the strategy that has brought U.S. travel exports to an all-time high, the Department of Commerce and ITA take groups of American companies to some of the world's fastest-growing regions: Central America, South America, and Southeast Asia, and we release data showing that more U.S. companies are exporting now than ever before. We also celebrated the anniversary of the U.S. – Colombia Trade Promotion Agreement; U.S. Acting Commerce Secretary Rebecca Blank recognized the anniversary while leading a trade mission to the region. Under this agreement, exports to Colombia's growing economy continue to increase. We continue the celebration this week by presenting Presidential Exporter Awards (E Awards) to more than 50 companies who are helping set the standard for export success. Companies like A.W. Chesterton, which manufactures specialty industrial maintenance products and actually earned an E Award in 1964. Or Nikolas Weinstein Studios, which went from having exports comprise 20 percent of business in 2010 to now having exports outpace domestic sales by 95 percent. One company’s export success has a magnitude of positive effects on the country. 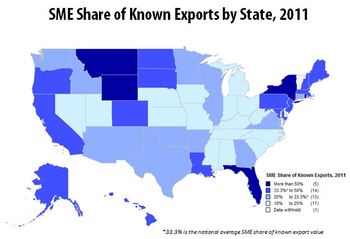 Exports create jobs, they fuel the supply chain, and they support local and state economies. I hope all of you take as much pride in our nation’s export success as I do. How can training and travel opportunities with the U.S. government help your company increase exports? We can tell you Thursday, May 23 at 2p.m. EST. Since the U.S.-Colombia Trade Promotion Agreement has been in place, U.S. exports to Colombia are up 19 percent, compared to the same period the previous year.